An analysis of core samples from the Greenland ice sheet finds clear evidence of the success of the US Clean Air Act and also shows a link between air acidity and how nitrogen is preserved in layers of snow. Forty-five years ago, acid rain was killing fish and dissolving stone monuments on the East Coast. Air pollution rose beginning with the Industrial Revolution and started to improve when the US Clean Air Act of 1970 required coal power plants and other polluters to scrub sulfur out of their smokestacks. For a new study published in the Proceedings of the National Academy of Sciences, researchers began their study of ice cores interested in smog, not acid rain—but discovered a link between the two forms of pollution in the geologic record. Nitrogen is emitted as a short-lived compound, NOx, which causes ground-level ozone, the main ingredient in smog, and relates to compounds that are the “detergent” of the atmosphere. Sources of NOx include smokestacks and vehicle tailpipes, as well as wildfires, soil microbes, or reactions triggered by lightning strikes. Teasing out the sources of NOx through history might tell us about the atmosphere of the past, how methane, ozone, and other chemicals change in the atmosphere, and also provide a measure of global human emissions. “How much the nitrate concentrations in ice core records can tell about NOx and the chemistry in the past atmosphere is a longstanding question in the ice-core community,” says lead author Lei Geng, a postdoctoral researcher in atmospheric sciences at University of Washington. Earlier research by co-author Eric Steig, professor of Earth and space sciences, suggested that comparing amounts of the two stable forms of nitrogen—nitrogen-15 and nitrogen-14—in nitrate could pinpoint the emission sources of NOx. Ice cores from Greenland and North American lake sediments showed the nitrogen-15 ratio gradually decreasing since 1850, suggesting a corresponding rise in human emissions. Not so fast, the new research says. The detailed measurements of nitrate, NOx and sulfur show the nitrogen isotope ratio leveling off in 1970, and suggests that ratio is sensitive to the same chemicals that cause acid rain. “This shows that the relationship between emissions and the isotopes is less direct than we thought, and the final signal recorded in the Greenland ice cores is actually not just the nitrogen emission, but the combined effect of sulfur and nitrogen emissions,” Steig says. 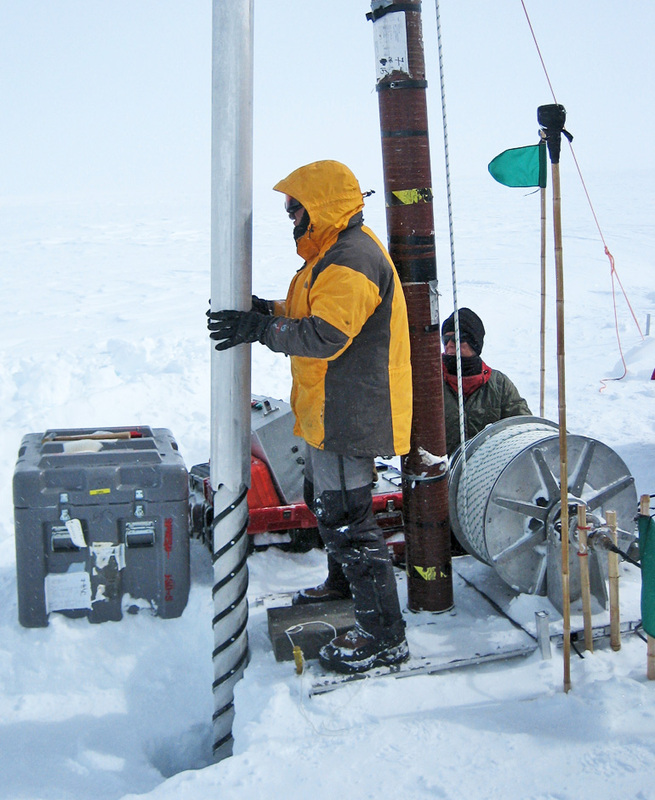 The ice cores used in the study were collected in 2007 at Summit Station, Greenland. Total amounts of nitrate for each year were measured and calculated at South Dakota State University, where Geng did his doctoral work. The different forms, or isotopes, were measured in University of Washington’s IsoLab. The work shows that the long-term decrease in the nitrogen-15 isotope since 1850, and its leveling off in 1970, are linked to changes in air chemistry. Airborne nitrate can exist as a gas or a particle, and nitrate with lighter isotopes tends to exist as a gas. But the total fraction of nitrate present as gas or particle varies with the acidity of the atmosphere, and the acidic air causes more of the light isotopes to exist as a gas. Other ice core records might also be affected by acidity in air, Alexander says. No effect would be expected for stable gases like carbon dioxide and oxygen, or for the water molecules used to calculate temperature variations through time. But acidity in air could influence deposition and preservation of other volatile compounds such as chlorine, mercury, or organic materials in ice cores. The National Science Foundation funded the research. Scientists from University of Grenoble in France contributed to the study.